SWF 2112: Poets, Harbour, pitches and more poets | Me fail? I fly! This was my first day at Walsh Bay, and in striking contrast to recent weather, the sky was cloudless and there was no wind – perfect festival weather. The tiny harbourside room generally reserved for poets at the Festival couldn’t have been a more appropriate venue for my first event of the day, Harbours and Rivers, with Robert Adamson, Neil Astley, Martin Harrison and Jennifer Maiden. I joined the uncharacteristically long queue with minutes to spare, and only when it became clear I wasn’t going to get in I realised I was in the wrong place: this time the tiny room had been given to young writers talking about the Second Novel Effect, and the poets had been given a much bigger and incidentally much darker space. I briskly walked the length of the Wharf and arrived part way through the introductions. The poets, refusing as poets should to be pigeonholed, paid at best slant regard to their allocated topic. Jennifer Maiden read a long new poem, ‘The Uses of Powerlessness’, which she described as a diary poem but was actually pretty much a philippic on Julia Gillard, not in the ‘X woke up in X’ form, but a straightforward furious meditation. 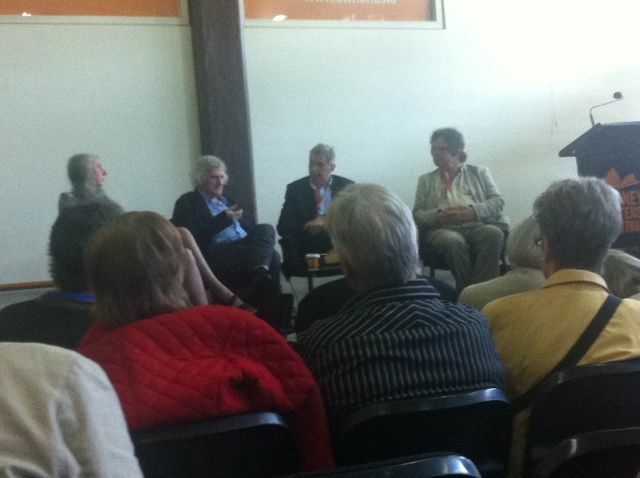 I wrote down one of many striking lines: ‘The Labor Party, like Gillard, is an obedience addict.’ Martin Harrison and Robert Adamson both spoke of the complex interplay between observation of the natural world and self-discovery. ‘All my harbours and rivers are internal,’ the latter said, somewhat disingenuously, ‘even though I live on a river.’ Among the poems he read was the sublime ‘Kingfisher’s Soul’, an intensely personal love poem that grows richer with each hearing. Neil Astley, advertised as editor of English publishing house Bloodaxe Books, turns out to be a poet as well. He was in Darwin for Cyclone Tracy, about which he read two striking poems followed by an excerpt from a novel that engages with an English countryside. In short, it was very good. Afterwards I ventured to introduce myself to Jennifer Maiden, but I was probably working so hard at no being too fanboyish for the conversation to have made much sense. After a brief interval I went to the Club Stage for So You Think You Can Write, my first time to this a regular Festival event in which random audience members get to pitch a project to a panel of publishers. 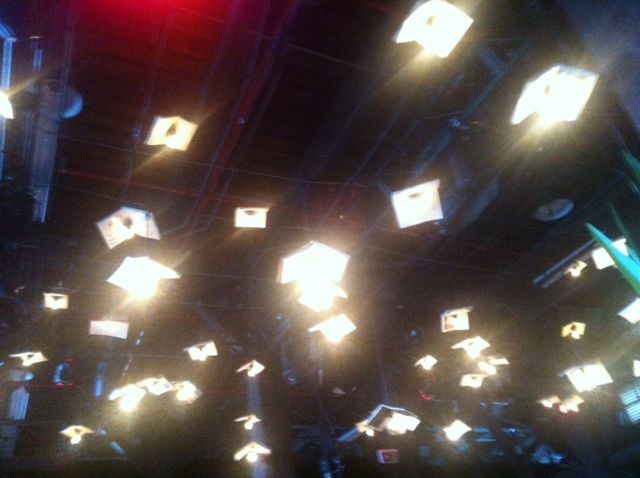 The specially decorative lights for the Club Stage area – each bulb has an open book for a shade. I don’t know that anyone who was at all savvy about publishing would participate in this, unless for the sheer fun of it. And it was mostly fun. A 15 year old boy pitched a detective story set among the Egyptian pyramids. There was an earnest tract for children aiming to foster leadership skills and an understanding of democracy. One or two pitches were for books that could have been anything, so broad were the descriptions. One woman had already had an iBook version of her project downloaded thousands of times. The winner – of nothing apart from the glory – was a psychological detective story in which the character realises a day of her life has gone missing and then is shown photos of herself taken on the missing day. The thing that won the audience and panel’s approval was that the photos were improbably and bizarrely orgiastic, involving vegetables and cigars in unspecified lewd ways. It may not be Scandi-Crime, but this audience loved it. You read about it here first. And then off to the poets’ lightfilled room. Gig Ryan and Kate Lilley, feminist-identifying experimental poets, drew an overflow crowd, including Adamson, Harrison and Astley from this morning, plus John Tranter, Ivor Indyk, Toby Fitch and many faces familiar from the Sappho open mike nights. Each of the poets introduced the other. They read from recently published books and, on being requested by an audience member to compose a poem together on the spot, they parlayed the request down to each of them reading a poem by the other – with interesting results. I confess that I went to this session expecting to suffer. I’ve read very little of either of them and my experience has been that if I don’t know a poet’s work I have trouble hearing it when read to me. (A possible contrary experience was hearing Jennifer Maiden this morning, but I am familiar with her voice and preoccupations, so had a head start.) Gig Ryan reads quickly, and her language is very compressed: I had difficulty distinguishing the words, let alone grasping the connections between them. Kate Lilley has a gratifyingly expressive delivery, and the woman beside me kindly allowed me to look over her shoulder and read along as the poems were read. But I was still pretty completely mystified. Both women talked about how people in their lives met their work with blank expressions, so I didn’t feel too stupid, or at least not alone in my stupidity. One of Kate Lilley’s poems, ‘Maisily’, consists of a string of about a hundred adverbs. This was the first time she’d read it aloud and it was quite a feat – all those lys. It seemed like pointless nonsense to me. Then she explained that it was made up of all the adjectives used by Henry James in What Maisie Knew. That made it seem like hi-falutin pointless nonsense to me. Then I remembered that it was part of an elegiac sequence about the poet’s relationship with her mother, and it no longer seemed so pointless – maybe I was finding an emotional subtext because that’s the kind of reader I am, but I did find one, like a deeply submerged nostalgia for childhood when the adult world was as inscrutable as to little Maisie in James’s novel. I wonder how it wold go if read, not as a near tongue twister, but with the rhythm of a tolling bell. As if the poets had read my thoughts, their conversation turned to the business of reading poetry aloud. Lilley said she knew and loved her poetry long before she heard her read, but when she did hear her read it was a revelation. Maybe my difficulty is as much to do with my increasing deafness as with unfamiliarity with the poetry. So the poetry was difficult, but the session was excellent. Both were very funny about the business of being poets, and how they see each other’s poetry. Even when they drew our attention to the complete absence of critical articles on Gig Ryan’s work, even though she is generally acknowledged as an important Australian poet, and surmised that this absence may well be because she is a woman, somehow that seemed richly comic. On the way home in the bus, I ran into an old friend who had been to a panel with Peter Hartcher, George Megalogenis and a third journalist talking about Australia’s parlous economic situation. I felt I had been very frivolous, but I was glad of it. This entry was posted in Books, Diary and tagged Gig Ryan, Jennifer Maiden, Kate Lilley, Martin Harrison, Neil Astley, poetry, Robert Adamson, Sydney Writers' Festival. Bookmark the permalink. I was a little disappointed knowing I could not be at the Writers Festival this year – but Jonathan you make me think I AM there – looking over YOUR shoulder. I enjoy your personal reflections mixed with observations from the speakers! Will you be attending the session with Edmund de WAAL (The Hare With Amber Eyes) – at the Opera House?/Town Hall? I am a seeker of family connections (my father dead in a car accident before I was conscious of his existence impels me, I know) – and there was a lot of that search in de WAAL’s book – and any number of points connecting with my own experiences in both Europe and Japan (including the improbable fact that I have five or six netsuke)! Thanks for posting the pic. I couldn’t get there but my mother (J.M.) said that it was a pleasure to meet you, and that you made pefect sense. She, too, was aware of the distance from the ‘Habours and Rivers’ topic, but everyone reassured her in advance that it didn’t matter, and that festival topics weren’t meant to be literal. It all seemed to work out okay, as she says the whole thing was very enjoyable anyway. She was pleased you liked the ‘obedience addict’ line, which is one of her own favourites from the poem. One of my own favourite observations from the poem is ‘To Gillard, power means/she can at last absolutely obey/the powerful’. Thanks for keeping me in the loop with such a vivid account Jonathan- all produced on the ipad no doubt! Thanks for comments, all. I’m glad my on-the-hoof notes give some joy. Sorry, Jim, I won’t be getting to Edmund de Waal’s session, though I’m surrounded by people who love the book and it’s next on the agenda for my Book Group. Michael: Yes, on the iPad, which is surprisingly easy to use while standing in a queue or sitting on a bus.